Are you responsible for inspecting construction milestones for WSUD assets? Do you want to learn tips on what to look for to ensure specification requirements are complied with? Clearwater and Melbourne Water’s Living Rivers Program have developed this training course to help local government improve their skills and processes in WSUD construction management to ensure WSUD assets are constructed as designed and fully-functional to accept at handover. 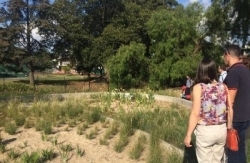 This training aims to improve theoretical and practical understanding of the hold points required for construction of bio-retention systems and wetlands specifically. Due to the technical content of this workshop, participants should have a sound understanding of WSUD principles and different types of stormwater treatment technologies. Our trainers are experts in their field and bring a wealth of knowledge and experience. Tea/coffee on arrival, morning tea and lunch are provided.